I’ve been thinking about my 88-year-old mother often this week. She’s been at my sister’s house for over a month now, which is a good thing, but it makes us all sad and worried to see how really terrible her short-term memory has become. While at my sister’s, she complained of tooth pain, so Beth took her to the dentist, who discovered multiple problems. Three appointments later over the course of a week, and Mom has a new filling, a new crown, and one less tooth, which had to be extracted. She remembers the dentist and his very kind staff each time she arrives there, but she does not remember having the work done. Yesterday, after Mom threw out some bad words and threw a tantrum and perhaps a kitchen item or two, Beth managed to get Mom to the extraction appointment—but by the end of the day, Mom thanked Beth for a nice day! Memory loss does have some up sides. Mom’s ability (propensity?) to switch from very happy to very grouchy reminds me of the days in my childhood when my parents were expecting company for the evening. The cleaning of the house was stressful, with much yelling at us kids; yet, when the doorbell rang, Mom would, amazingly to me, be all smiles and cheer with the guests. I attributed this to her having been a drama major in college and a fine actress on stage. Maybe this memory about grouchiness during cleaning has also been on my mind because I’ve been doing a lot of cleaning this week, partly in preparation for Memorial Day houseguests but also because it was just plain time to take care of the messes that have been piling up as we built and set up the new lake cottage. It was time for that pile of faucet and interior door catalogs to go! Tonight I plan to iron and/or put away six weeks of clean clothing that has been hanging in the laundry room waiting to be taken care of. Yesterday I vacuumed and dusted in places that haven’t seen a cleaning implement since the start of football season last fall. This type of deep cleaning doesn’t make me cry, however. I rather enjoy doing it, when I have the time. I put on music and get Zen with it. Late yesterday, Seals and Crofts’ Hummingbird came on. The B melody of that song is so beautiful that it brings tears to my eyes every time, and lately I have enjoyed my tendency to cry at everything sad or beautiful (like the end of Shrek, as my daughter likes to tease me), because I am able to cry. At my last eye doctor appointment, the doctor pronounced my dry-eye problem severe and sold me a Bruder Moist Heat Eye Compress, which I have been using. After a couple months, to my delight I now cry copiously from both eyes, whereas for many years only my right eye would tear up, and that just sparingly. Hooray! I’m crying! I will end this essay with the story about crying that I have been wanting to tell. Last Saturday, two of my granddaughters went with me and Bob to a neighborhood dinner at the lake. It had been a long, fun day of playing at the beach and the kids were tired, but they behaved well, until the floodgates broke and Maddie, freshly 3 years old, broke down. With her wailing loudly, I quickly departed the party with the girls and started the walk home, three houses down. The tears suddenly stopped—not unlike my Mom when the company arrived. “There’s a chipmunk,” was the reason, and we spent a few happy minutes watching the chipmunk explore the holes along the wall, until it finally chose one to disappear in. “Okay, let’s go,” I said, and I took Maddie’s hand. The wailing then took up right where she had left off. Not to laugh at someone else’s tears (okay, I did), but imagine that! It’s me again, more or less ready to get back to blogging after a way-too-busy six months. What have I been doing all that time? Editing, grandchildren, not enough biking, holidays and out-of-town family, football and tailgate guests, more editing—and more. There have been many, many blog-worthy days since last September, and maybe I’ll get around to telling the stories of them sometime. The biggest item taking up my time has been the building of our lake cottage. Over Mother’s Day weekend, both of my daughters and their families came to break it in. What a great time we had! Boating, relaxing, eating, leaving behind all cares other than to sit back and watch the grandkids swim (with or without bathing suits; we weren’t prepared for the day being swimmable) and throw a ball into the water for Ali’s dog to fetch. This encapsulates the “dancing” of my headline: there is little in life better than a lake and family, and my soul dances with joy. There has been much “dirt” along the way to realizing the dream of a vacation home located just minutes from our regular home. My husband has marveled at the hours I spent picking out the perfect floor tile or most excellent faucet; he scoffed at the pineapple-shaped lights I found. It’s part of the dirty work of building, but now that the cottage is (mostly) put together and liveable, we agree that each cabinet style, each doorknob, each wall color and floor covering is perfect! The literal dirt of the newly built cottage has mostly been cleaned up; there is no more sawdust in the corners of the cabinet drawers. Many days of wiping and sweeping and of putting beds together and installing window treatments have come at the expense of the appearance in our regular house of dreadful messes and thick dust. 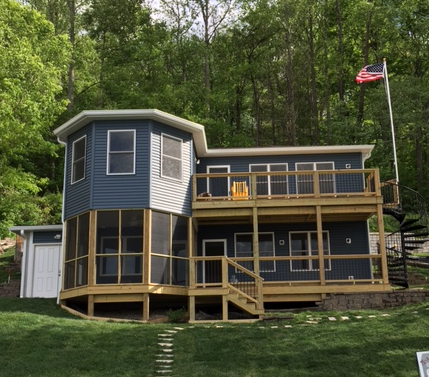 As of Saturday, however, when the kids arrived at the lake for the weekend, I declared an end to the building process. Things that need finishing will have to wait in line with other priorities, such as biking and other fitness activities and hobbies that have been neglected. Back to dancing with the fun of retired life! A fine trail race called, in fact, Dances with Dirt helped mark this transition. Ali and I ran the 10K version of the race on Saturday. It’s a race whose website warns that trail conditions will halve your running pace. And they use the term trail loosely. The woods were spectacularly beautiful; but if you were out for a woodsy hike or even a run-of-the-mill trail run, would you look at an insanely steep, muddy, rocky ravine and say to your companions, “Let’s go down that as fast as we can”? Or “why take the path along the stream—we could just walk in it”! Or, “Say, there’s a deep spot in that icy cold river, let’s go that way”! The worst part of this awesomely fun race was the first muddy uphill, which is so muddy it is named “Slime Hill.” You wind slowly back and forth across the trail looking for a semi-solid area to put your $100 running shoe (okay, of course you wear a very old pair). A time-consuming and dull way to go, which is the only reason it is the worst part. Finally, you give up and just stick your feet anywhere and revel in the cold feeling of mud seeping into those shoes and the sucking sound they make coming up again. Way to dance! I am pleased to report that our pace was 20:06 min/mile, for a finishing time of 2:04. There were only two women over 60 running, so I was first in my age group and my status as a crazy old woman confirmed. A more complete report is available in my daughter’s blog at http://nurturehernature.com/2017/05/just-little-dance-dirt/. 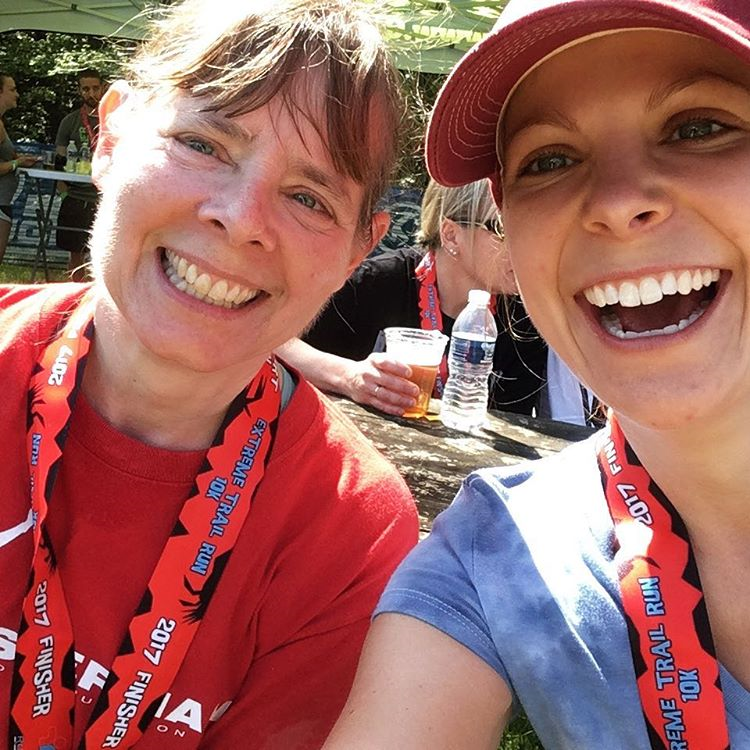 While highlighting there my near-race-ending crash at the starting line, she neglected to mention that we laughed just as hard at the one item she made sure to carry with her on the course—a pair of tweezers to pluck out ticks and crush them to death. Luckily the only use it got that day was cleaning the dirt out of her nails! Published on November 3, 2016 By Kathy3 Comments on Try Mountain Biking—Done! Although my 60th Birthday Bucket List has now morphed into a 70th Birthday Bucket List, I intend to keep young by not waiting until age 69 to try new things. Yesterday it was “try mountain biking,” an item that went undone during my 59th year. How did it go? Well, I am a little surprised that I don’t feel about 70 years old today after the grueling evening we 20 or so riders had last night! Very surprised, in fact, as I made a number of mistakes concerning the ride. 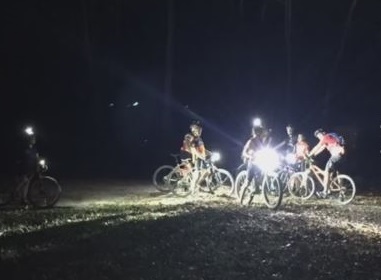 First thing: don’t do your first mountain bike ride ever in the dark. Most of the ride was in the dark. 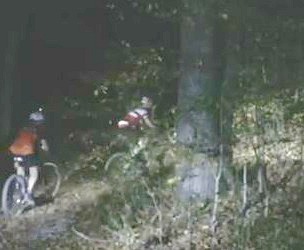 Second thing: don’t do your first mountain bike ride ever in the dark when the trail is obscured by fallen leaves. It is tough to navigate when (1) you don’t know the trail and (2) the trail is hidden by leaves and (3) it is dark. Did I mention this was a night ride—in the dark? Third thing: learn how to navigate over logs and rocks before trying to keep up with experienced mountain bikers. I was the rank amateur not to mention raw novice on the ride, and even on road rides everybody who went on this ride rides faster than I do. On the other hand, large logs and deep gullies slowed down the other riders too, which gave me chances to catch up with them from time to time. 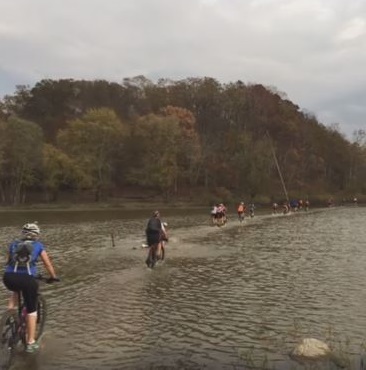 By the way, the biggest obstacle on the ride was the lake. Didn’t stop us. We rode right across. Fourth and perhaps most basic thing: remember that “gravel ride” means “mountain bike ride” to this particular ride leader. I have gone on many gravel rides, even at night, before with a different group, but to them, “gravel” means gravel roads. 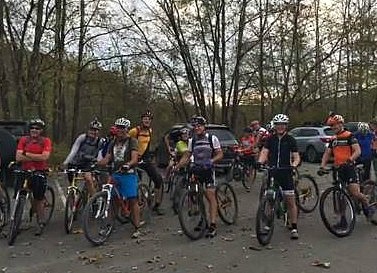 The group who rode last night considers any surface with one or two stray pieces of gravel on it a gravel road, even eight-inch-wide double-black-diamond trails on soft earth built on the side of a ravine, or former gravel roads that are now covered hub-deep by a lake. My mistake, not checking the route more carefully; yet, it was listed at 18 miles, which is pretty long for a mountain bike ride in the dark, so I figured a large percentage of it was real gravel roads rather than trails. Never assume! In my defense on this score, the group as a whole was surprised by the difficulty of the ride, and it finished up over an hour later than anyone had figured. A big positive was the riding itself. Once I learn how to ride mountain bike trails, the beauty of the forest will be easier to appreciate—yes, even in the dark—and the technical challenges of the riding will become less of an issue. The muscles I used last night that aren’t used for road biking and that are tired today will strengthen and help me speed up. And I’ll put into practice a few things I learned, such as to use flat pedals rather than clips until I get good at this type of riding; to secure gear very securely because of the jolting it takes; and, especially on an unknown route, to carry more water and food than you think you’ll need. One of the mantras of mountain biking as opposed to road riding is “you will fall.” Did I fall last night? Yes, twice. Only one was due to a rookie mistake (braking when I hit a log instead of rolling over it), and the other was just a routine tipping over similar to the falls taken by at least six other riders on last night’s ride. It just happens. See you on the road or trail! Bring lights! Thanks to Yusuf Nur from whose Facebook post about the ride I stole these photos. In the group photo immediately above, that’s me in the center in the yellow jersey. Many, many moons ago, I cried when I reached the end of a great book. It was the final volume of Tolkien’s Lord of the Rings trilogy, and it wasn’t a sad ending that made me cry but rather it was so good and so engaging a story that I didn’t want the book to end. My mother stayed at our house for 10 days this month. Like most 88-year-olds, she has her favorite stories, one of them about how one of the nuns at her school used to say Mom would be late for her own funeral. Though Mom admits her life-long character flaw of being consistently late for everything, she thinks that being late getting to one’s funeral would be a good thing. She’s right about that! Published on August 1, 2016 By Kathy4 Comments on I Won! Birthday Bucket List item “do a sprint triathlon that I haven’t done” was accomplished yesterday and accomplished in fine style, if I can say so myself, modestly. I won in a number of ways. Published on July 21, 2016 By Kathy2 Comments on Go to a Rock Concert — Done! A couple of days after I wrote the previous post in this blog, I developed a cough. No cold symptoms occurred first or allergy symptoms beyond the usual background summer plugged-up-ears and occasional need for a tissue. Rather, a constant, juicily productive cough, cough, cough just suddenly appeared, and now my speech bubbles are peppered with coughs and hacks. Very annoying. For 12 days now. I have finished the Harvard MOOC I was taking. The course was called “Book Sleuthing: The Nineteenth Century,” and it is part of a series called “The Book: Histories Across Time and Space” that looks at the physical aspects of books rather than their content per se. The series examines books based on their paper, ink, and binding. It looks at hand-lettering and printing, as well as artwork, and it looks at who was reading the books and how.